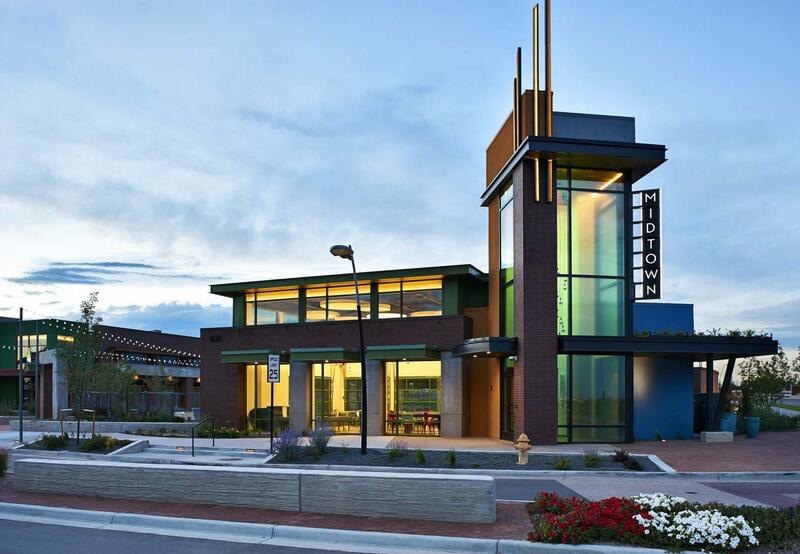 The Midtown Shed is a community center for a residential housing facility in Denver CO. The Shed incorporates the community center as well as several retail spaces. In addition to the retail spaces is a large outside garden area with plenty of seating and a few fire pits. The outside garden has a dog park as well as walking paths throughout. The area was built for the community it surrounds. Thus, residents can attend functions such as cooking classes, concerts, lectures, and anything else the community wants to offer. The Midtown Community Building project consists of a single-story steel-framed building with no below grade space. The footprint is approximately 57’-0” E-W by 46’-0” N-S, however, the footprint of the building is irregular with half of the building on a 30° skew from the rest of the building. There are three different levels of roof on the building. There is high roof on a tower element that makes up the main entry. This tall space is completely open on the inside. There is a mid-level roof over the main space which is a multipurpose gathering space. There is a clerestory all around this roof below the eave. And finally, there is a low roof over the support spaces which include a kitchen, restrooms, and storage. All the roofs are flat with built-up rigid to create the slopes for drainage. The two higher roofs extend out to create an eave and the low roof has a parapet all around it. The building has a series of low canopy roofs around it as well. There is a cantilevered roof over the main entry, a canopy roof behind the tower element, small canopy roofs along the front of the main space and a large canopy roof over a patio at the back of the building. These roofs are solid except for the large canopy roof over the patio which has a triangular opening with steel plate fins that act as sun shades. There is also a pavilion roof structure and a monument roof structure. Both structures are solid and act primarily as shade or decorative elements.